A combination of Open Heart Surgery and Treatment Catheterization opens up exciting new treatment possibilities. Shaare Zedek’s advanced Catheterization Room was inaugurated last week. The new facility allows heart surgeons and cardiologists to work together more safely in performing complex procedures on high-risk patients. For example, a 60-year-old man with carotid artery and aortic valve stenosis was treated in the new room. 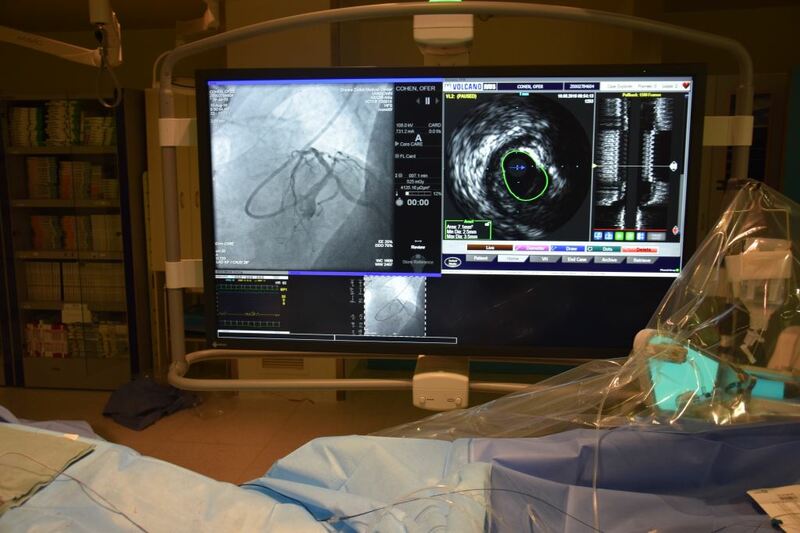 At the same time, Prof. Danny Bitran, Director of the Thoracic Surgery Department, conducted bypass surgery and Dr. Yaron Almagor, Director of the Interventional Cardiology Unit, performed catheterization. "The special capabilities this new facility allows us meant we could plan an original strategy,” says Dr. Almagor. “The patient was suffering from a number of complexities that didn’t allow open heart surgery. His life was in danger. After examining all the possibilities, we decided on a new approach, which to date has only been tried on a few patients around the world. The new Catheterization Room is the first of its kind in the country and was planned specially for particularly complex procedures. The room enables three-dimensional viewing and navigation and is equipped with advanced simulation machinery. The technological system operates on low radiation, is connected to all the other hospital systems, works simultaneously with a large number of screens transmitting real-time data. The room also boasts an adjustable, gyroscopic bed that enables maximum accuracy and precision.